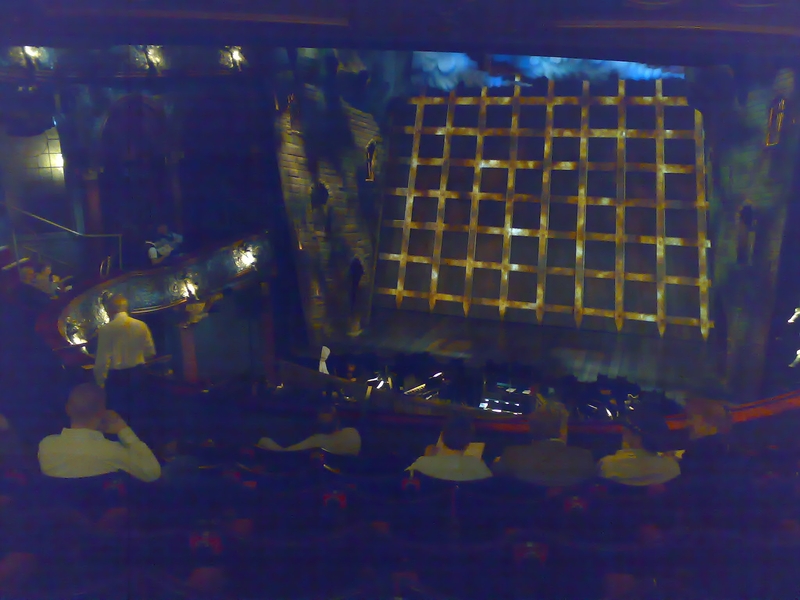 I was only saying to the wife on Monday morning, as we negotiated the tube and industriously ignored the crowds who could hear every word in 5.1, that I would like to go do the new West End show; Spamalot. It was as if fate itself traveled on the Central Line. Why? Because, I walked into work and the Operations Manager came out of his office with two free tickets for tonights performance and would anyone like them? 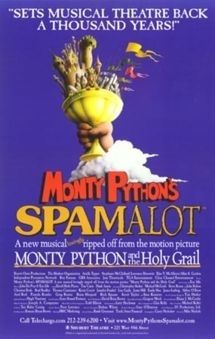 Monty Python’s Spamalot is a comedic musical “lovingly ripped off from” the film Monty Python and the Holy Grail (1975). Like the film, it is a highly irreverent parody of Arthurian Legend, but it differs from the film in many other ways, especially its parodies of Broadway theatre. Eric Idle, a member of the Monty Python team, wrote the musical’s book and lyrics, and collaborated with John Du Prez on the music. Running since March 17, 2005, it was directed by Mike Nichols, and won the Tony Award for Best Musical of the 2004–2005 season. Spamalot’s plot follows King Arthur as he journeys to find the Holy Grail. Arthur, traveling with his servant Patsy, recruits several knights to accompany him on his quest, including Sir Bedevere, Sir Robin, Sir Lancelot and Sir Galahad. Along the way, they meet the Lady of the Lake and a host of other odd characters, including Prince Herbert, The French Taunter, Tim the Enchanter, Not Dead Fred, the Black Knight and the Knights who say Ni. What ever happened to my part? It was exciting at the start. And I’ve had nothing yet to do. If you don’t have any Jews. Yes, indeed the whole audience gasped when that line was sung. It goes on, and gets funnier, and the Operations Manager and I have since said that my work (which is Jewish) must go to this show ASAP! The only missing scenes are the “Bridge of Doom” and the attack on castle Arrrrgg (my favorite bit – “That’s a dangerous weapon!”) everything else is in and performed with great style. The stage sets are amazing and special effects are everywhere. Tim Curry is excellent, if a little stiff in the dancing. The rest of the team are very good indeed and dance all over the place. However, I would say that for the obsessive Python fan, who I would class as someone who not only knows the words but also the inflection of tone used by the original members, that this show does take a liberty with the source material. Timings are different and you will yearn for the Python voices and cast readings. Moreover, this is not just a sketch show on stage and some passages and parts are largely expanded. For example, the “Dennis” scene is dovetailed into a large section about Dennis becoming Sir Galahad. All this worry goes to nothing and everything is right with the world when they sing “Always Look on the Bright Side of Life” I am sure that you will sing along with everyone else, whoever you are. Only John Lennon’s “Imagine” is a song with more hope in it. So, fun for everyone. My wife (who professes a hate for Python) loved it every bit as much as I did and that is the highest praise I can give it. Rating of 8 out of 10 and very funny.